How and Why is Asbestos Dangerous? We often hear that asbestos is dangerous, but what does that mean? What health conditions are caused by exposure, and how much exposure is necessary for asbestos to be a danger? Exposure to asbestos dust and fibers can result in cancer, lung disease, as well as other conditions. Unfortunately, there is no known level of exposure that is considered safe. While the use of asbestos has been banned in the U.S., exposure is still common, as there are exceptions to the ban, and as asbestos is still present in many older buildings and homes. In fact, asbestos-related health conditions continue to increase worldwide. People most at risk include those who are exposed on the job, but those who decide to take on do-it-yourself projects in homes containing asbestos insulation may also be at risk. Activists have done a good job in making the public and policy makers aware of the risk of one type of lung cancer – mesothelioma – caused by asbestos exposure. For those who question whether their efforts to raise their voice and ask for change when their health is at risk, this is an excellent example of how individuals can indeed make a difference. Malignant mesothelioma – Mesothelioma is a cancer the begins in any of the areas where mesothelium is found as noted above, but commonly occurs in the pleura (the membranes around the lungs.) It is an aggressive cancer, with only 5 to 10 percent of people surviving 5 years beyond their diagnosis. Lung cancer – Lung cancers other than mesothelioma are also increased by exposure. Both non-small cell lung cancer and small cell lung cancer are increased. Ovarian cancer – Less well known is the increased risk of ovarian cancer. In a review of studies to date, it was thought that occupational exposure to asbestos increased ovarian cancer risk by around 70 percent. Other cancers – Studies thus far have been mixed, and it’s uncertain whether or not asbestos exposure increases the risk of laryngeal cancer (cancer of the throat,) or colorectal cancer. Pleural effusions - Some people exposed to asbestos develop a build-up of fluid between the membranes that line the lungs. This has been called benign asbestos-related pleural effusions (BAPEs). What Level of Exposure is Dangerous? 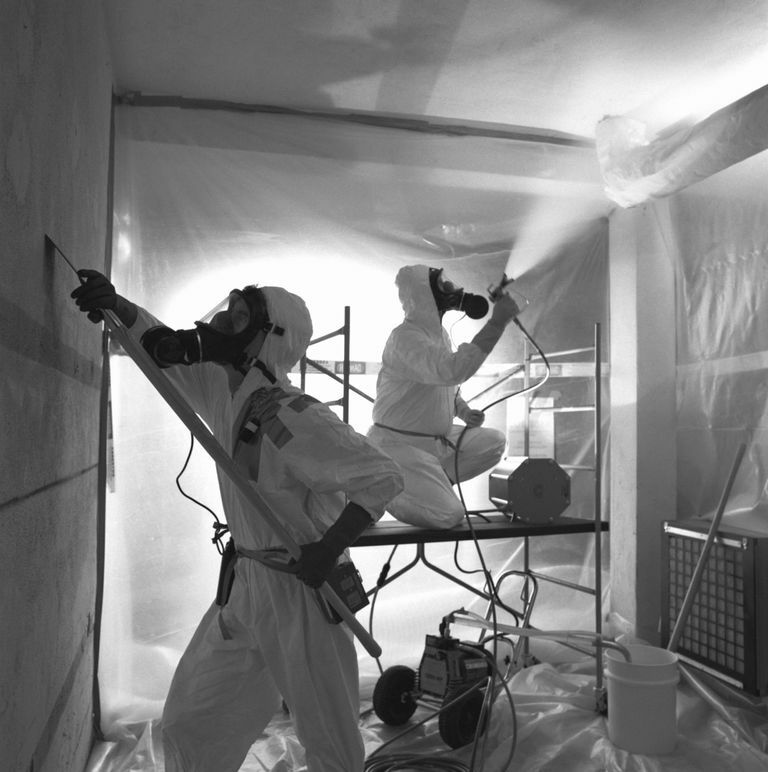 A common question is, "how much asbestos do I need to be exposed to be at risk?" The answer is that there is no level of asbestos exposure that is safe. But a few studies have helped to answer the details in that question. Asbestos exposure in non-smokers – There were 3.6 times as many cases of lung cancer. Asbestosis in non-smokers – The risk was 7.4 times that of the general population. Smoking without asbestos exposure – This risk of lung cancer in those who smoke was 10.3 times that of the general population in this study. Asbestos exposure plus smoking – Exposure to asbestos combined with smoking made the likelihood of lung cancer 14.4 times the average. Asbestos exposure, asbestosis, plus smoking – If people were exposed to asbestos, developed asbestosis, plus smoked, the results were grave. The risk of lung cancer was 36.8 times higher than the general population. We can look at asbestos exposure in another way to get the big picture and to further outline the problem for those in industry. It’s been estimated that 170 tons of produced and consumed of asbestos correlate with one death from mesothelioma. An important question is how important the length of exposure is -- in other words, are those who are exposed for 30 years more likely to be affected than those exposed for 5 years? We don't have studies that outline the exact risk over time, but it's likely that the longer someone is exposed, the greater their risk of asbestos-related disease. That said, there are some people who have developed mesothelioma with an exposure time of only a few days. How is Asbestos a Danger? How asbestos damages the body is likely a combination of fiber type and size, lung clearance, and genetics. A few theories have emerged. In one, it’s thought that asbestos fibers may directly have a toxic effect on the cells lining the lungs, causing inflammation which leads to scarring. Part of the damage may also relate to the body’s reaction to the presence of asbestos fibers, as the body secretes inflammatory substances such as cytokines and growth factors in response to the foreign substance. New evidence suggests that the presence of asbestos causes direct DNA damage to cells, which in turn can result in cell abnormalities and cancer. The best way to avoid asbestos-related health problems is to practice safety first. What does this mean? What Can You Do if You’ve Been Exposed? There isn’t currently a lung cancer screening test recommended for people who have been exposed to asbestos, as there is for smokers, but it may be worth talking to your doctor. A study done in 2007 suggested that low-dose CT screening for asbestos workers may be at least as useful in detecting lung cancer in the early stages as it is for heavy smokers. That’s significant considering that later guidelines in 2013 found that screening people with a 30 pack-year history of smoking who were between the ages of 55 and 74 could reduce lung cancer deaths by 20 percent. Certainly, if you have been a smoker in addition to being exposed to asbestos, a conversation with your doctor is a good idea. A 2017 study found that spirometry may be an excellent tool for screening for lung cancer in those who have been exposed to asbestos. In fact, based on results of the study, researchers recommended that anyone who has been exposed to asbestos should have spirometry done and have it repeated every three years. The Agency for Toxic Substances and Disease Registry (ATSDR) has developed screening guidelines for asbestos-related disease including cancer as well as lung conditions. These guidelines recommend that you see a physician who is familiar with asbestos-related disease. (I can’t emphasize how important this is as some physicians rarely work with people exposed to asbestos.) Another problem with those who have been exposed to asbestos is that CT screening frequently reveals “false positive” tests – meaning that something may appear abnormal when it is indeed okay. For example, in one study, over half of asbestos workers had at least one abnormality noted on a CT scan. In addition to screening, spirometry, and asbestos protection, perhaps the most important thing anyone can do is refrain from smoking. There are also other things you can do that may lower your risk. If you have any concerns, make sure to check these out. Tips for Preventing Lung Cancer – Some are Not Obvious! Camargo, M. et al. Occupational exposure to asbestos and ovarian cancer: a meta-analysis. Environmental Health Perspectives. 2011. 119(9):1211-7. Centers for Disease Control and Prevention (CDC). Asbestosis-related years of potential life lost before age 65 years – United States, 1968-2005. Morbidity and Mortality Weekly Report. 2008. 57(49:1321-5. Jamrozik, E., deKlerk, N., and A. Musk. Asbestos-related disease. Internal Medicine Journal. 2011. 41(4):372-80. Liu, G., Cheresh, P., and D. Kamp. Molecular basis of asbestos-induced lung disease. Annual Reviews in Pathology. 2013. 24(8):161-87. Markowitz, S. et al. Asbestos, asbestosis, smoking, and lung cancer. New findings from the north American insulator cohort. American Journal of Respiratory and Critical Care Medicine. 2013. 188(1):90-6. Wender, R. et al. American Cancer Society lung cancer screening guidelines. CA: A Cancer Journal for Clinicians. 2013. 63(2):102-7.